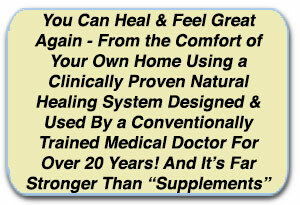 The Best of Both Worlds - Conventional Medicine and Natural Healing! 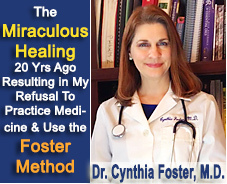 Dr. Cynthia Foster M.D., a conventionally trained medical doctor knows both Western medicine and natural healing and, for the past 20 years, has been using the Foster Method, a natural healing protocol, to help her patients heal at home from all types of health issues - and without any expensive lab tests. Her patients have reported cancelling various types of surgeries, loss of excess weight, clear skin, infections cleared up, energy returning to youthful levels, reduction or disappearance of pain, discontinuance of prescription medications and much more. 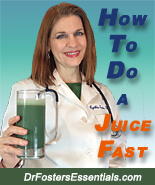 Dr. Foster learned highly secret natural healing techniques during the very years of her conventional medical school training over 25 yrs ago in order to save her own life from a 4-year battle with epilepsy marked by grand mal seizures so severe they resulted in frequent shoulder dislocations, excruciating pain, memory loss, difficulty speaking and extreme headaches. Without a single epilepsy medication or medical treatment, and using only natural healing techniques, she was completely cured of epilepsy and has been seizure-free for over 20 years. After receiving her medical degree, she began practicing holistic healing in the late 1990's, being able to repeat her own personal healing results with thousands of people nationwide. You can use the Foster Method safely and comfortably to heal yourself in the privacy of your own home - even if you're really sick. Click here to see videos of actual patients who used her turbo-charged highly concentrated formulas and did the Foster Method at home. Click here to know how to get started with the very powerful and effective Foster Method. How to Get Started: "To benefit from my twenty plus years of experience in treating patients holistically, click to the right or go to the top of the page to find the "Learn" tab that will take you to various health articles I've written on important health issues that could be affecting you now. Read through the articles and learn about about the secret methods I used in my underground clinic where I saw people so sick, they were on the verge of dying. Learn the first step and how to get started here! You can also start with my Beginner's Program"-Dr. Foster. Everyone Can Do This: The good news is that most people can do a lot to help themselves. Most natural healing routines can be done in the privacy of your own home. Everyone has the right to take care of themselves - and, once they learn how, it’s easy! There is Hope For You: "People have come to me over the past 20 plus years because they had a severe health problem, or the doctors had already told them they were going to die. But because I have a conventional medical background, and because they had read about my own dramatic recovery from epilepsy in my book Stop the Medicine, they understood I wouldn't be intimidated by the severity of their problem. I am also a medical intuitive. After 20 years of praying over my patients to determine what was wrong, I have developed the ability to see and feel the traumas in people's lives that cause them to get sick. Click here to learn more. I Discovered Most Vitamins and Herbs Are Not Strong Enough: Most of my patients had failed the conventional medical treatment and they were in my office because I was offering natural alternatives and people were defying their doctors' predictions and recovering. One thing I noticed right away when I started my natural practice was that people were not recovering with vitamins or herbs in capsules. They just weren't strong enough. People came to me with shopping bags full of supplements that were not working for them. 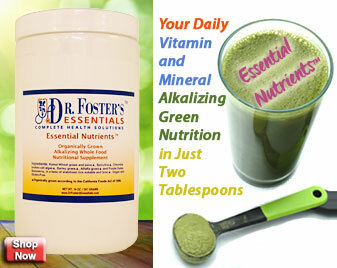 (Click here to learn the truth about most natural supplements on the market). I had to design custom formulas for the issues my patients had and concentrate the remedies about 10 times stronger than the weak, watered down versions they were buying in the health food stores and drug stores. When I did this, toxins started pouring out of their bodies and they made more rapid progress." - Dr. Foster. My Own Complete Cure From Epilepsy: My involvement with natural healing came out of my desperation to find a cure for the epilepsy that was causing me to have up to two seizures a day and to be in excruciating pain. After all of the best doctors at my medical school repeatedly misdiagnosed me, I went to see a holistic nurse who completely changed my world by teaching me about healing foods, juicing, herbal detox and supplements. After suffering from daily seizures for over three years, I decided to refuse any and all medical treatments for the epilepsy and complete embrace the holistic healing. My thinking was that I would heal myself holistically so I would be well enough to get through "real" medical school and become a "real" doctor. I did not take any seizure medication or have any surgery. Instead, I underwent a very strong herbal detoxification program - a comprehensive program that addressed every organ in my body (Click here to see the full program Dr. Foster followed for herself and has been using with her patients for over 20 years with step by step details)- which resulted in a complete cessation of the epileptic seizures in three months. All of this I did while still in conventional medical school. I had the unique opportunity of experiencing a life-changing natural healing while simultaneous learning conventional medicine. 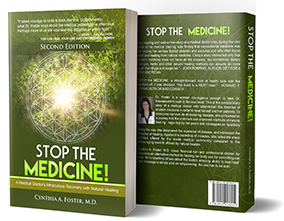 You can learn how it all worked out in my book Stop The Medicine!" Still in Remission Over 20 Years Later: Over 20 years later, I continue to be healthy with no return of those previous health problems. I offer the same program I used to heal myself on this website which is called the 28-Day Healing Program along with the Peaceful Nerves Formula. 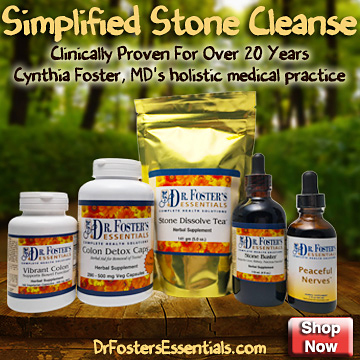 [Add to Cart] [View Cart] Get Started With the Simplified Stone Cleanse! Organic Herbal Formulas and Cleanses? Make sure to Join My Mailing List to receive my complimentary E-mail newsletter in which you can learn from step one, how to do natural healing programs I did for herself and for my patients. 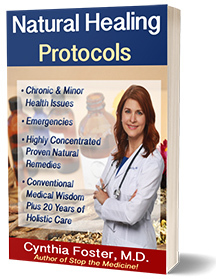 You will also get a downloadable copy of my Natural Healing Protocols at no charge - valued at $34.95. You can use all of these protocols to help yourself recover your health and gain vitality - all in the comfort of your own home. With the finest in herbal healing, aromatherapy, healing foods, juice fasting, massage, emotional healing, energy healing, spiritual healing and other natural healing therapies, Dr. Foster will guide you through the maze and direct you on the path to your own personal healing. Take The Online Quiz: Don't miss our online quiz to get recommendations specific to just you and your unique circumstances - even if you're taking medications and have multiple health problems. Just click above on FREE Herbal Recommendations to get started. It’s so advanced, it even alerts you to the common side effects of the medications you're taking. You can’t get any easier than that! This is Not About Taking Vitamins - This is Different! This information goes far beyond vitamins, most of which have a synthetic base and can actually cause health problems such as an irritated bladder or prostate caused by taking synthetic Vitamin C. (See The Shocking Truth About Your Vitamins). The really powerful natural healers that were curing incurable diseases were jailed and run out of business by the pharmaceutical giants - their vast natural healing knowledge almost completely lost. 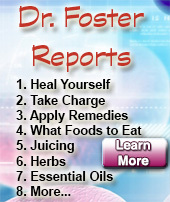 True natural healing knowledge has been kept secret for over 5 generations. Find out about the extreme hardship and poverty I went through to bring you this information. The Missing Link: In my almost 20 years of experience in healing people with incurable diseases, I have discovered that the entire body is important and that each and every organ in our bodies are related. The large intestine is related to the lungs and every other organ in the body. The small intestine is related to the heart. Brain function is tied to the liver, prostate function to the colon, kidneys and bladder, bladder function is related to the colon, and all systems are related to the hormones. I and other natural healers fail if we recommend a single supplement while ignoring severe health issues in other areas of the body. Why People Don't Heal: People cannot heal from kidney failure by taking just kidney herbs. They cannot heal from liver failure by taking just liver herbs. People's cancers don't go into remission by taking just antitumor herbs. Severe Alzheimer's cannot be cured by taking just ginkgo or a few brain herbs. They can't take the weak and watered down herbs available in most drugstores and health food stores (Learn more about herbal product strength) It takes much more than that. These people can heal, and they can heal completely, when they embrace the holistic model. Miracle Healings That Are Possible: When they embrace a healthy lifestyle with healthy organic foods, strong, concentrated herbal remedies, an exercise program, stimulate the circulation with cold water remedies, castor oil packs, release energetic and emotional blocks, do some juice fasting and put this all together into a COMPREHENSIVE PROGRAM, that is when I have seen miracles - literally growths pushed out of the body, severely senile patients beginning to speak again after being mute for years, infections healed without antibiotics, a colon cancer passed during a fever routine, and more. This happened because of an entire program that was put together with ALL organs of the body in mind, with the aim of strengthening the entire body, and not simply the part of the body that "seemed" to be sick. When an entire program is followed every day with herbs to help the entire body, such as Dr. Foster's 28-Day Program, it takes on average about 2 1/2 to 3 months to see a dramatic shift. This is when we begin to see healing miracles. Herbs and Emergencies: This is what I'm good at. I've had years of experience helping people who refused to see regular doctors, so I had to pull out all the stops to help them avoid the emergency room. I want everyone to know which natural remedies to stock in their medicine cabinet so they can be prepared for whatever life hands them. So make sure you go through this important life-saving information entitled Herbs and Emergencies, so you’ll know what to do for fevers, heart attacks, strokes, burns, etc. Please share this info with your friends and loved ones. Thanks for visiting!" "Everyone is Looking For a Good Doctor. I am Looking For a Good Patient. Are You Willing to Make Changes? Do You Have What it Takes to Get Well?"